All we have to do is return to the land and our problems will be over, right? Well, if you’re sitting in Alaska in February and the snow is blocking the windows, you might beg to differ. The shipping costs of all that heavy produce would make it very hard to get large quantities of it to people. It doesn't take an apocalypse for the vegetables to grow up the side of the apartment buildings. We don't need no Will Smith hunting deer in Times Square. We just need a reshaping of our priorities. Produce has to be successfully integrated into our network on a variety of levels to really promulgate the kind of produce revolution that we might want to see happen, from a child being empowered to plant a seed to the Feeding America be empowered to source billions of pounds of produce from new sources as part of its ‘Feed’ initiative which is part of their new strategic plan refresh. Can anything good from making a pun on a tired 70’s soft rock anthem? 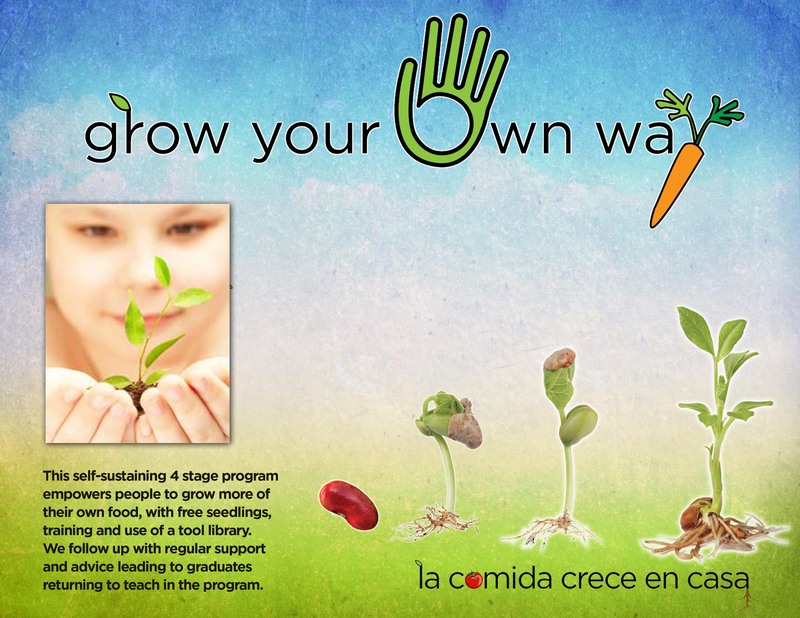 I firmly believe it can, and so we find ourselves with the ‘Grow Your Own Way’ program. Why get food from the Foodbank when you can grow your own? We want to directly engage people in the process of providing some of their own food. I don’t mean walking down to the 7 11 and scoring a bag of hot cheetos, I mean sticking a seed in the ground and sticking with that sucker until it produces something that you would eat yourself. You don’t need lots of land. You can start with a plastic bucket on the balcony of an apartment building. This program helps people get involved, get confident and then in turn help others. Nothing tastes better than when you grow your own way. We are currently recruiting community members, like Master Gardeners to train to do this specialized kind of outreach in our community. Now obviously, when we try and grow something ourselves, we mess it up. The dog pisses on it, or our sheer build up of a lifetime of bad karma nukes the poor little seeds before they can even stick a sprout skyward. That makes it paramount that a program like this is rolled out in an environment where you come into contact with the same people on a regular basis. We utilize GYOW during our monthly Healthy School Pantries and our weekly Brown Bag program for senior citizens. That way we can deal with the inevitable collapses and help people move forward, with provision of seedlings, then letting them borrow from a tool library, then facilitating them arranging volunteers to prepare larger areas of land, all the way through to having people come through the program and help to run it. Now that’s growing your own way. The next step up from people doing their own thing is for them to be involved in a community garden. 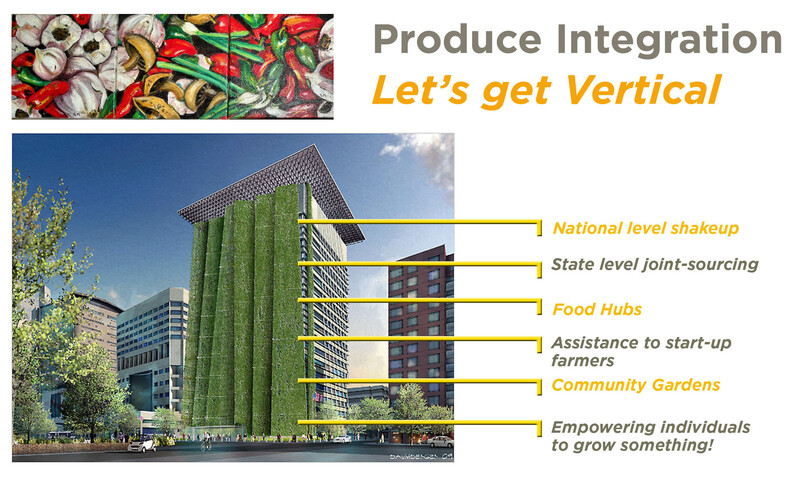 There are so many great examples of these, and I think one of the niftiest is the ‘Incredible Edible Garden’ which is co-run by Second Harvest Food Bank of Orange County. When I went up to visit them, outgoing CEO Joe Schoeningh explained how the land utilized was wasteland owned by the city, and under the shadow of electric pylons. They did a deal with the city to utilize the land and to turn it into a city park with a bicycle path, albeit a city park that would generate food rather than the usual flowers. The smart part was that now that it was designated a city park, then the city was obligated to kick in money for the upkeep, so that they could supplement the volunteers with a paid staff. Broccoli, lettuce, potatoes, carrots, beans and squash are among the crops grown at Irvine’s Incredible Edible Park. 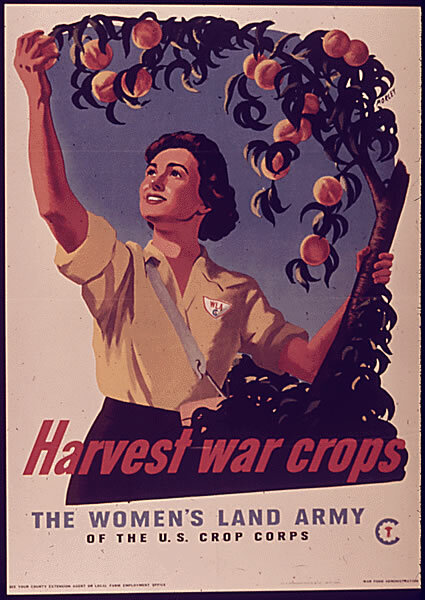 People of all ages, including many school children, have helped plant, weed and harvest produce. Second Harvest Food Bank of Orange County distributes the food to those who need help. 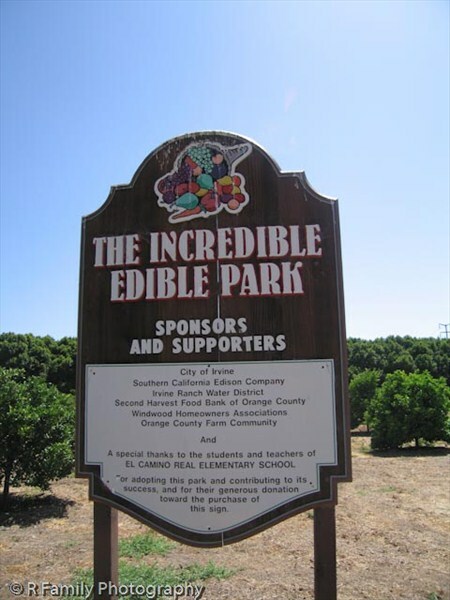 The first, and perhaps only, edible park in California gives bikers a tour through a farm for the hungry as Irvine expands its bike trail system from Irvine Center Drive to the Walnut Trail. The expansion provides a pathway through the edible landscape site, which helps Second Harvest Food Bank provide for more than 200,000 people every month, as well as provides a link to the city’s more extensive bike trail system. More than 80 citrus trees of various types have been planted in this unique garden. The Incredible Edible Park project will grow further, with future expansion plans that include three additional acres of row crops. What a great model. 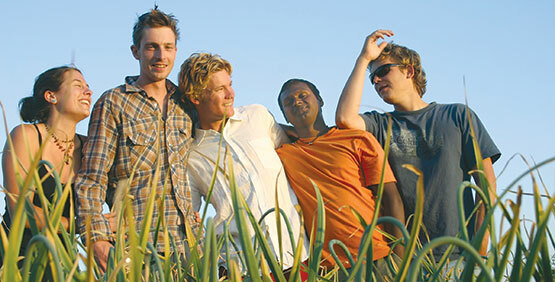 Why isn' there a 'Young Farmers' reality show? Put 5 zany characters into an open field and see what happens. You can only get so far with giving away food or people operating individually or in small groups to grow some of their own food. If you are serious about local food security, then you have to get with those who get paid to do this stuff for a living. Farmers. Of course we are used to having relationships with established farmers, usually based around us asking them for donations. Apparently in Santa Barbara, we have something called ‘the Santa Barbara syndrome’ which is used as an example in food security discussions nationwide. I had no idea that we were worthy enough to have an honest to goodness syndrome! I thought you had to be barking mad like Keira Knightly in “A Dangerous Method’, but apparently not. The Santa Barbara Syndrome is that we export 95% of our fresh produce out of the county and then import the majority of what we need to eat from other areas of California and beyond. You can imagine all the wastefulness of resources, carbon footprint issues etc. One way of beginning to change this situation is to help those start-up farmers looking to grow more of their own food, for their families and to sell. 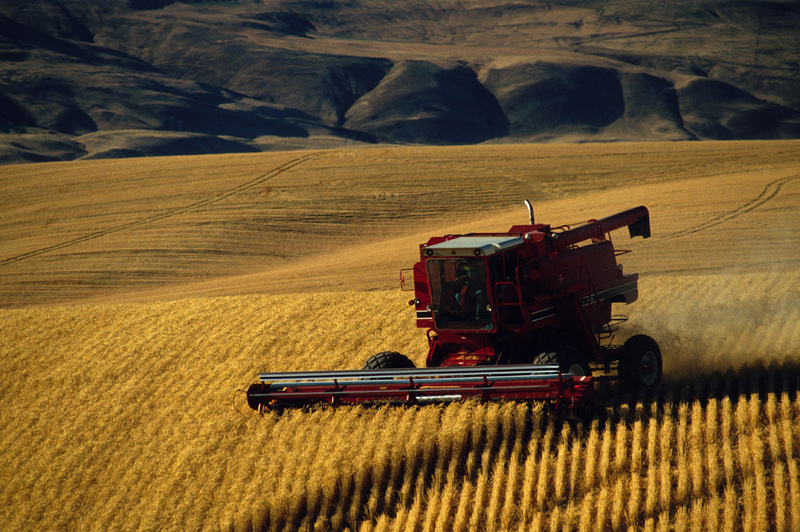 Compesinos from Mexico come to the U.S. with experience of growing a wide variety of crops in a small physical footprint. They often find their skills are not useable in the huge monoculture environment they face. We need to be offering them the training and support to build food security for everyone. The Food Bank in Tucson has an excellent program for start up farmers which is worth checking out. We have a new board member, Carla Rosin, who is interested in developing this area and we look forward to integrating it into our range of programs. The consequence of assistance to farmers and of food banks involving themselves in area-wide distribution is that their is an opportunity to create a food hub, which is the true basis of local food security. 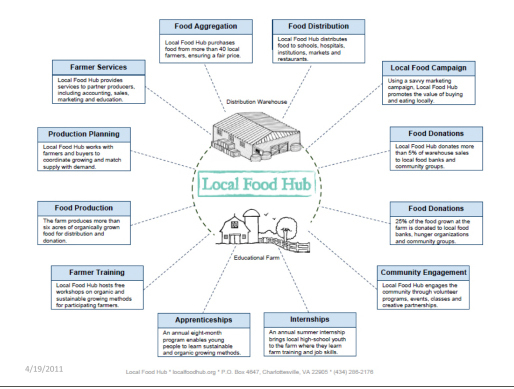 Food hubs blur the lines between the traditional roles of those involved in commercial growing, emergency food distribution etc – and usually in a creative though challenging way. Local food policy councils can also help in this area. To my way of thinking, food banks belong at the center of such a hub. We have something to crow about in California, and that is the California Association of Food Bank’s Farm2Family program. This program has facilitated a dramatic increase in the amount of fresh produce made available to the Golden State. It provides for those food banks who opt in to make commitments to purchasing specific poundages of certain fruits or vegetables (if they are available). The CAFB then works with produce solicitors statewide to purchase seconds for pennies on the dollar, which are then shipped in refrigerated vehicles to participating food banks. This program has become a model, which Feeding America has looked at how to scale to a national level. The twin focus here is identifying new sources of produce at all levels of production from the largest commercial farming organizations and also the type of Washington DC advocacy that brings these issues to the attention of law makers and motivates them to do more than sit politely at a meeting and then proceed to triangulate their way out of taking a firm position. If, as food banks we are working and succeeding at each of these levels, then we are truly using fresh produce as a powerful tool to move us from where we are to where we want to be.